The market-leading textbook, Purchasing, has defined the course since its first edition. 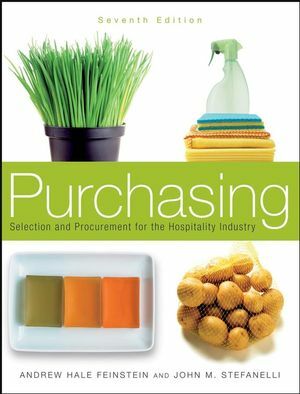 Purchasing: Selection and Procurement for the Hospitality Industry emphasizes the managerial principles of purchasing functions. Through six editions, Feinstein is considered the ultimate resource for professionals in foodservice and lodging operations who conduct training courses on purchasing goods and hospitality services. Andrew Hale Feinstein is Professor and Associate Dean at the William F. Harrah College of Hotel Administration at the University of Nevada, Las Vegas. He also serves as the Senior Advisor to the President of the University. John M. Stefanelli is a professor in the Food and Beverage Management Department at William F. Harrah College of Hotel Administration at the University of Nevada, Las Vegas. 1. The Concept of Selection and Procurement. 2. Technology Applications in Purchasing. 4. Forces Affecting the Distribution Systems. 5. An Overview of the Purchasing Function. 6. The Organization and Administration of Purchasing. 7. The Buyer's Relations with Other Company Personnel. 8. the Purchase Specification: An Overall View. 11. The Optimal Payment Policy. 15. Typical Storage Management Procedures. 16. Security in the Purchasing Function. 18. Processed Produce and Other Grocery Items. 27. Furniture, Fixtures, and Equipment.